Thank you for clarifying. I hope to learn more about your findings when available. It sounds like you are trying to establish serious criteria which is great. I'm downloading images of my double-loop-whorl thumbed friend. The quality is not great. I believe its because she just finished cooking and washing dishes. How would you classify Lori's thumb print? It seems to me like a single loop that whorls itself around the thumb - opens only to one side. Its bit hard to tell because the print doesn't entirely cover the full width of thumb. NOTICE: Only in a 'double loop whorl' both loops are completely surrounded in a whorl-like pattern. Does this make sense for you now? Hi Lori, thanks for posting clear prints. I can see that double loop now on right thumb!! (remember some months ago I thought it was a loop, I couldn't see the top loop coming in on the original print, I can now!) So you were right all along, both thumbs are composites :-) Apologies for my mistake, it doesn't alter the over-all reading too much because you already had interpretation for double loop on left thumb. I'm still getting used to the composites prints. Would you consider loop 261 in page 1, your earlier post, to be regular or whorl-type double loop? Also what kind of loop would you consider my friends prints? 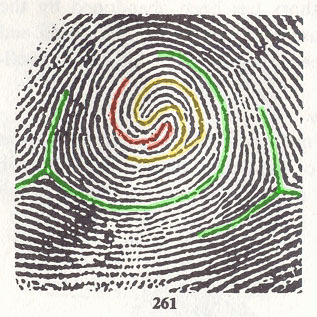 While in the FBI book pattern 261 is formally correct described as a 'double loop'; we could specify that indeed to a 'double loop whorl' - because obviously there are 2 loops in the center (yellow and red color), but both loops end in the whorl-like curling ridges between the two triradii (green color). zaobhand wrote: ... Also what kind of loop would you consider my friends prints? I have drawn a few lines in your friend's right thumb fingerprint... and I am quite sure that you will now know my answer! PS. 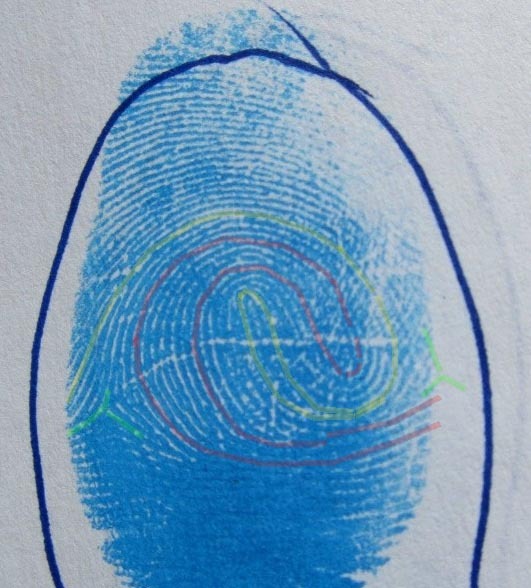 Sorry, the quality of the left thumb fingerprint is not very good - though I think it is a typical 'double loop' as well. Thank you for your detailed response! Yes, it makes sense though I find it still rather tricky. For example part of ridges of the 'yellow' loop actually seem to originate from the right side similar to the 'red' loop. Anyway I think I'm getting better feeling for the different classifications. So basically, my friend actually does have normal double loops, yet she doesn't seem to manifest the typical characteristics. I don't really know her that well, so I'm trying to see her personality under various circumstances. Will update in case I discover anything. In your analysis you should really focuss on the 'core' ridges of both loops (which relate to the center of each loop). There is no need to consider other ridges... actually, that could explain a large part of your confusion. 4 - and the major lines are quite well developed. These could all be recognized as elements which provide 'compensation' for the double loops!??? Just to add my two cents of perspective of composites on the thumbs. This is the most common place I see composites. To me it's more about the energy of where the composite resides. On the thumbs it has to do with on the right hand - getting tangible results in the world daily. A composite usually is 'on' or 'off'. That means when it's 'on' and the composite is located on the right thumb, the owner is 'on' about being a doer, manifesting, making decisions and making things happen - getting tangible results. When it goes 'off' then it feels like sloshing through mud to make a decision and get anything to happen. When and how it goes on and off is a mystery. The people I know with composites who are conscious of this recognize the switch has gone off and focus on another project. It usually goes off related to a specific project at a specific time for an unspecified amount of time. When it goes back on, you feel energized about that focus again. It doesn't mean everything goes to the wayside. An experienced palmist,a friend of mine, says that a separated head-life line helps offset most of the attributes of a composite on the thumb. The two people I know (including my friend whose palms I posted earlier) who do not seem to fit the composite attributes have the separated head-life line! (Martijn has also suggested this feature to be important). we discussed the composites in our course with Richard, but I still can't fully agree the on and off interpretation. I have a composite on my right thumb - together with a connected LL / head line on the beginning - and my life experience are not really according to it. May be there are other factors against this in the hand. Decision making or to be concentrated on a subject and to get results I wouldn't could to my weak abbilities. I always find remarcable synchronicities or to do two things, themes, working fields at the same time. But this could also be a fruit of my doublle Life Line. 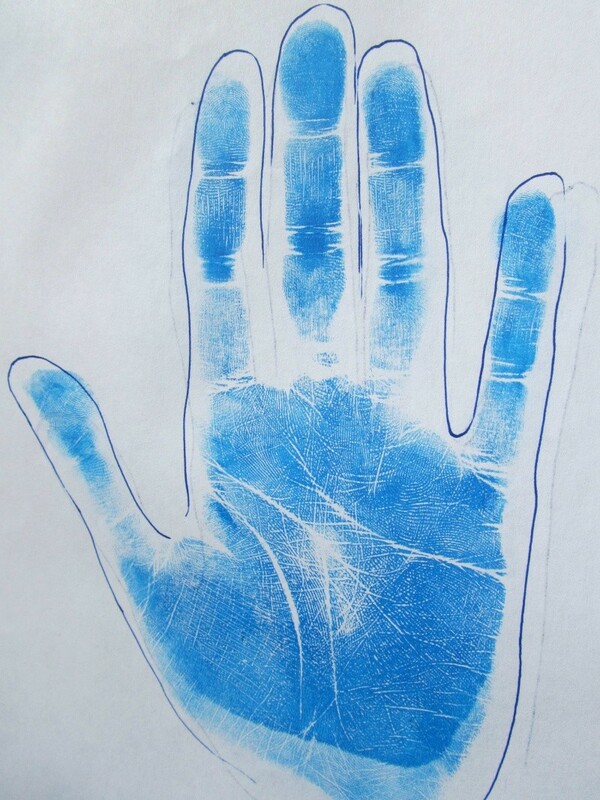 Do you mind sharing with us your palm prints. 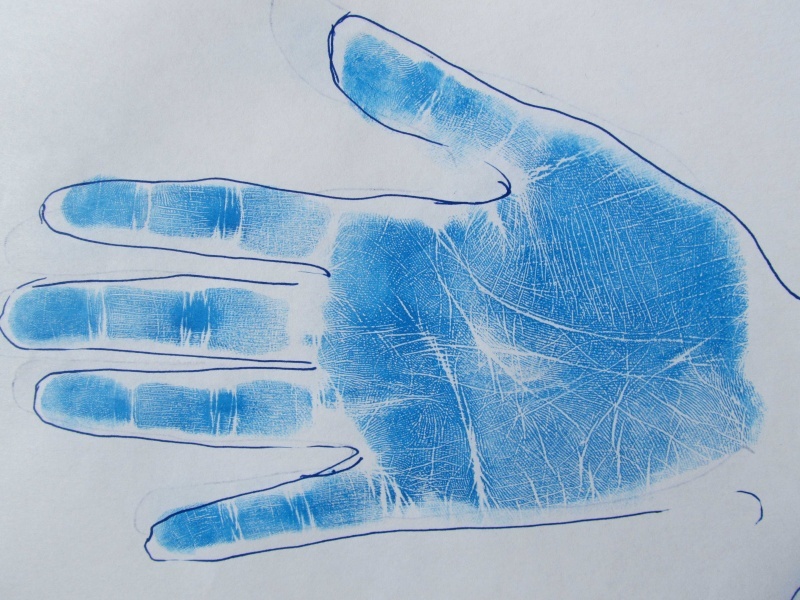 "...to put in the hand print or birth chart is like walking naked on the High Street." Would watching other people naked on the high-way be considered voyeurism? Manfred, interesting concept of the separated head line offsetting the composite. I don't know that my experience bears that out. Off the top, it would seem it could add even more challenge to a person's life. I know that the on-off switch may not always be as true for people as it seems. Again, the location is really important. Left Jupiter, the on/off may be about how you feel regarding your passions or how you stand up for yourself, advocate for yourself. Maybe there are times when you are fully passionately involved in a project, Then the switch goes off and the passion diminishes some. Or you can stand up for yourself much of the time, then there are times when you don't and you're not sure why. Could any of this be true for you? thank you for your answer. I think, the on/off switching is a possibility, but for my personal experience I would say it isn't too much important. I have primary loops, a doubble loop on the right thumb, radial loop on rught Jupiter, worl on left Jupiter - if this is interesting for you. May be I my life trick is if I'm not allways fully passionated in my outer world profession, I have/had always a passionated subject in the other hand: Palmistry, astrology, religion, occult studies and others. I would await, that some other feature collures the doubble loop formation, like the beginning, signature of the head line and others. Bringing this up as it relates to our current discussion. I think Lori's thumb prints are ulnar lateral double/twin loops. Also Christopher if you are reading this, I think her left middle fingerprint is made of concentric circles at the core. Hi Manfred, I just read Pamelah's comment and your response and I agree with you. I have these double loop patterns on both thumbs and I seldom feel like I have an on/off switch. Just an "on". I would associate it more to how I see myself affected by my sun in Libra and those ever moving scales. I think I follow. Thanks! Pamelah wrote: Just to add my two cents of perspective of composites on the thumbs. This is the most common place I see composites. I have these double loop prints on both thumbs and I read your response here just the other day and at first thought, no, I don't have an on/off type of switch. But, the way I can identify is that I can multi-task intuitively. So at times I may appear to be distracted or no longer paying attention in one area as I have switched my main attention to another. I nearly missed your nice foto!!!!! I think I've wrote it before: Regularly we find an important Libra influence with composites on the thumbs. I think it's easy to combine Arch with Earth and Loop with water, but not unambiguity (what a word from my dictionary!) with the other two. I can only say that (more) whorls show a strong influence of Scorpio/Pluto which belongs to fire/water mixed. This throws a very interesting light on the interpretation of whorls.